Looking for new stitches that add interest to a piece is something I spend alot of time doing (that, and browsing the incredible selection of yarn that’s available these days). I imagine most crocheters have their favorite stitch, one they find themselves using more than others. 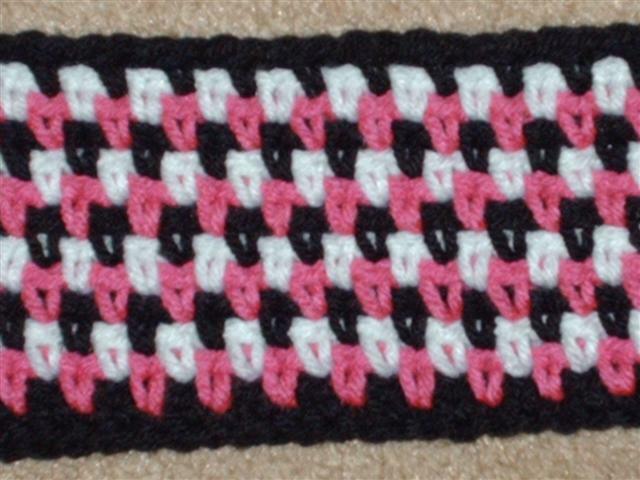 One of my all-time favorites is the granite stitch, aka seed stitch. It’s one of the most incredibly easy stitches; sc, ch 1, sk 1 st, sc in the next stitch. On the return row, you sc in the ch-1 spaces and ch-1, sk next sc, sc in ch-1 space. It works well using solid colored yarn or variagated yarn. But the magic really happens when you use different color yarns on alternating rows. The first pic shows what you get using 3 colors. I really like using the black and white with a 3rd color. Imagine using complementary or contrasting colors. The possiblities are endless. 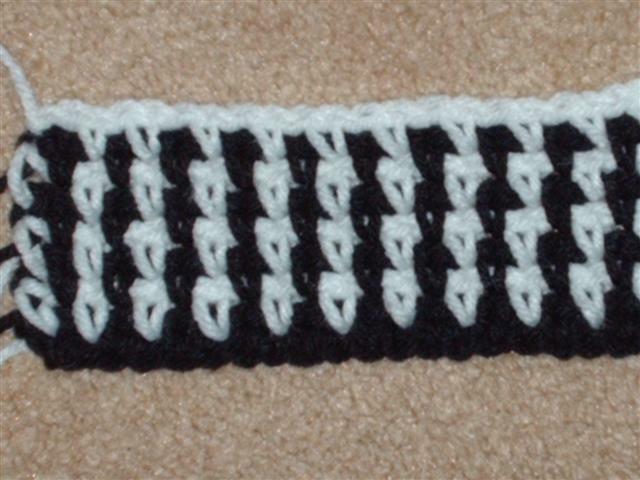 This next pic (ignore the loose ends….it’s a swatch) shows the magic that happens when using only 2 colors, alternating rows…..instant stripes! I encourage you to learn new stitches to add to your repertoire. Use the stitches and yarn to their full potential and make the magic happen! This entry was posted in crochet, stitches and tagged color, crochet, effects, granite, seed, stitches, technique. Bookmark the permalink. Lovely!!!! Now you have my mind going…what can I do with that stitch! !